This homemade recipe produces delicious candy corn look-alikes that'll liven up any Halloween party. The taste and texture of these candies is different from standard store-bought candy corn—they're much softer, have a sweet vanilla-marshmallow taste, and—dare we say it—even tastier. It's not a difficult recipe, but it is time-consuming because the candy corn kernels must be cut out individually. To speed up the process, you can use purchased fondant or white marzipan. Stir the marshmallows with a rubber spatula until they are melted and smooth. If some marshmallow pieces remain, return to the microwave for 30 to 45 seconds, until the mixture is entirely smooth and free of lumps. Scrape the marshmallow-sugar mixture out onto the prepared work surface. It will be sticky and lumpy with lots of sugar that has not been incorporated yet—this is normal. Dust your hands with powdered sugar, and begin to knead the fondant mixture like bread dough, working the sugar into the marshmallow with your hands. Continue to knead the fondant until it smoothes out and loses its stickiness. Add more sugar if necessary, but stop adding sugar once it is smooth—too much sugar will make it stiff and difficult to work with. Once the fondant is smooth, divide it evenly into three balls. Set one ball aside, this will be the white portion of your candy corn. Take one of the remaining fondant balls and flatten it into a round disc. You might want to wear gloves to avoid getting food coloring on your hands during this step. Add 4 to 5 drops of yellow food coloring to the center of the disc and fold the disc over on itself so that the color is enclosed in the center of the fondant ball. Begin to knead the ball of fondant just like you did before. As you work it, you will begin to see streaks of color coming through from the center. Continue to knead until the streaks are gone and the fondant is a uniform yellow color. Repeat the process with the third small ball, adding orange coloring (or a combination of red and yellow to produce orange), so that you end up with three smooth fondant balls, in white, yellow, and orange. Now it's time to roll out the candy corn. If you have a very long countertop or workstation you can do it all at once, but if you are pressed for space, you might find it easier to divide your fondant balls in half and assemble the candy corn in two batches. On your powdered sugar-coated workstation, begin to roll the yellow fondant ball into a long worm shape, using your palms to roll it into a very long, thin cylinder. The exact size will depend on your preference for the size of your candy corn, but a 1/4- to 1/3-inch thick is recommended. Try to keep it the same size along the length of the fondant strip, but some minor variation is fine. Once the yellow worm is rolled out, repeat the process with the orange and the white strips, placing them next to each other when completed. When you finish you should have three long cylinders of yellow, orange, and white fondant, each approximately the same length and width. If your fondant is slightly sticky, you should be able to press the strips together to create one unified fondant strip with three colors. If they are well-dusted with powdered sugar, they might not stick. If this is the case, you can wet a pastry brush and lightly run it along the sides of the strips, and the water will cause them to fuse together. Once your strips are firmly pressed together, you should be able to start cutting. 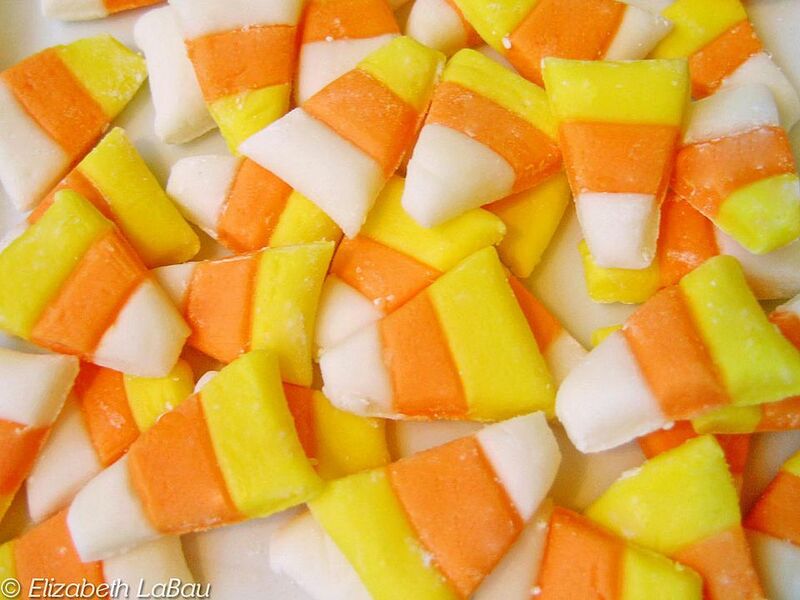 Cutting them in their present state produces a rounded candy corn. If you prefer a flat candy corn, you can very gently run a rolling pin along the top of the tri-colored fondant strip, to flatten the tops and press them closer together. Use a large, sharp knife to cut triangles out of the fondant strip. Unlike store-bought candy corn, these kernels will have alternating white and yellow tips. Store homemade candy corn in an airtight container at room temperature for several weeks. This recipe will get sticky if exposed to too much moisture, so try it is best made and stored in a place with low humidity.